SO, YOU’VE GOT this pet octopus. Let me guess, she keeps trying to escape. Opening the lid to her tank, pushing the lid, creeping across the floor. You always manage to catch her before she squeezes herself down the bathtub drain. Sounds like you need a quick lesson in octopus husbandry.By the way, you are not alone. Several months ago, anoctopus named Inky escaped from the National Aquarium in New Zealand (he was eventually found at a nearby offshore reef and brought back). In that case, someone had accidentally left the tank’s lid ajar, so Inky made a break for it. But wait, if octopi—pardon, I mean octopuses—are smart enough to make like Andy Dufresne, should you be locking them up in the first place?Well, before getting into all the hand-wringing about animal intelligence and stuff—which we will get to, don’t worry—know this: “Every animal tries to get out of its tank, that’s normal,” says Christine Huffard, research technician and octopus expert at Monterey Bay Aquarium Research Institute. What makes octopi—ugh, octopuses—different is they are actively good at escaping, because they are intelligent. “In the wild, octopuses use coconuts to hide in, save and use them again, showing active tool use. They solve puzzles, open jars, and guard their dens in a way that shows a pretty high level of perceiving the world and responding to stimuli in a very directed manner,” says Annie Lindgren, a cephalopod biologist from Portland State University. So, while some people might interpret an octopus escape as a sad cry for help, it’s probably more likely the animal is bored, curious, and just plain hungry. “Separate from intelligence and curiosity, these are animals that need to eat a lot of food,” says Huffard. In the wild, they usually roam territories ranging in the tens to hundreds of yards looking for something to munch on. But the largest aquarium tanks are just a fraction of that volume. So. Care and feeding of your octopus, step one: Feed it often. Step two, give it plenty of stimuli. That means rock formations to lurk around in, moving water, maybe some bubbles. Also, give it some challenges. “I do things like put food in a jar, or stuff the food in a wiffle ball, or, because I’m a glassblower, I make these big, long glass tubes they have to crawl through to get their food,” says Richard Ross, head aquarist at California Academy of Science in San Francisco. Ross says the jars and food puzzles keep the octopus on the bottom of the tank. “When you feed them from the top of the tank, they get habituated to food that comes from the sky, and you’re like, training them to escape,” he says. “I try not to give them much interaction at the surface at all, even though it is fun to have them crawl on you.” O-Kay. Step three, make sure it has enough space. But not too much. 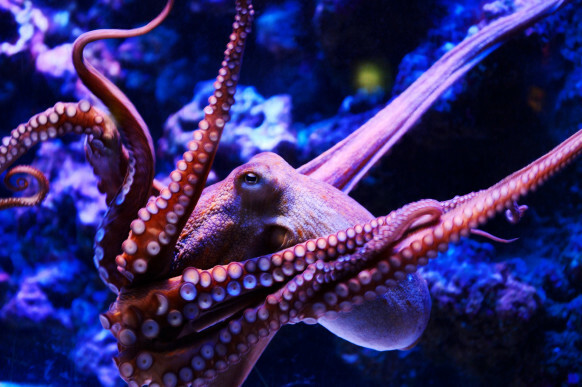 “People with direct experience housing octopuses know that if you put them in too large a tank, they will jet around too much and injure themselves,” says Huffard. Also, be thoughtful about what other creatures you add to the tank. And not just because you’ve heard stories about octopi—ugh, last time I swear, octopuses—killing sharks at the Seattle Aquarium. Octopuses are solitary creatures, and consummate hunters. So eventually, they are probably going to go after whatever you put in the tank with them, or that thing will go after them. The real problem with keeping an octopus, says Lindgren, is that caretakers don’t have standardized rules for doing so. Those who keep vertebrates have the Institutional Animal Care and Use Committee, which contains food, shelter, and handling guidelines for anything with a spine—from lab mice to elephants. This 2007 paper outlines some ethical considerations for using invertebrates for science experiments. Which could be useful for would-be octopus-keepers, so long as they don’t try to vivisect the animal. And now, the handwringing. Should you be keeping this octopus at all? On one hand, animals kept in captivity serve educational and conservational purposes: People are more likely to advocate for saving animals they have encountered in a zoo or aquarium. On the other hand, not always. Also, what if octopuses are smart enough to know they are being kept? Doesn’t this break some kind of moral code, that humans have a duty to treat any creature that has crossed a certain intellectual threshold as equal? Maybe. But probably not. Despite the compelling nature of a story about an active octopus escaping to the wild, octopus behavior isn’t complex enough to suggest that they are cognizant animals. “They aren’t cooperatively hunting, they aren’t communicating complex ideas,” says Huffard. “They may say, ‘I will fight you, I will mate with you, I will eat you,’ but that is nothing compared to, say, the complex ways that spiders interact while mating.” Coming soon: WIRED’s guide to spider care. Oh and finally, the best way to keep your octopus from escaping its tank. Close the lid. Cover it with a brick. Or, you know, just don’t own an octopus.